Our school menus are lovingly prepared by the East Anglian Taste for Schools company, aka "Eats". These foodies are passionate about preparing wholesome food that the children love. Their menus fully comply with the latest school food regulations, and meet the criteria for the Bronze Standard of Food For Life. At least 75% of the dishes on the menu are freshly prepared in our kitchens. All the meat we use is farm assured as a welfare minimum. The eggs they use are from cage-free hens. The staff are supported with professional development including training in fresh food preparation. Food on the menu does not contain any hydrogenated fats or undesirable additives. For more information regarding nutrition, allergy and weekly menus, please visit the Eats website. The price of a child school meal is currently : £2.30. Please note that all school meals must be paid for using parentpay on the day that the meal is required or the Monday of that week. The meals are cooked on the premises and eaten in the main hall. All Meals must be paid for using parent pay. Should your child be absent, any money paid will be credited to future lunches. Children may bring a packed lunch if you prefer. Please note that we are a nut free school. Please ensure that containers are unbreakable and leak proof. Free school meals are available to those pupils whose parents are in receipt of certain benefits. 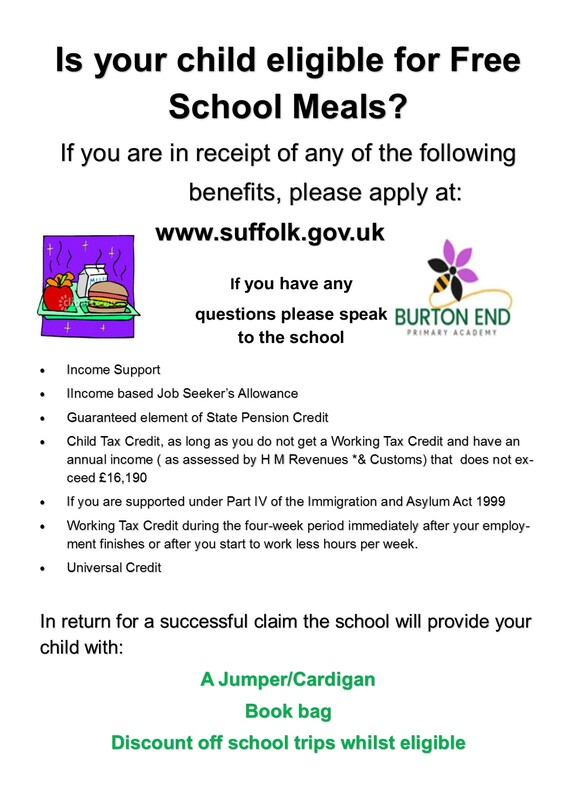 To apply you need to visit www.suffolk.gov.uk and click apply for free school meals.. All free meal arrangements are, of course, confidential and no child is identified in any way. From September 2014 all children in Reception and Key Stage 1 will be entitled to free school meals. If you need any further information please speak to the school office. NOTE: Information regarding allergens is provided by the ingredient manufacturer. Eats and its employees do not assume responsibility for this information or a particular sensitivity or allergy to any food item it provides. Please be aware that cross contamination may occur between ingredients. Based on our product mix and preparation, we cannot guarantee that any menu item is completely free of any allergen.